Though we put a lot of hours in at TOKY HQ, we’re also fans of getting out into the world to engage with the design, branding, and publishing industries at large. This spring, four of Team TOKY are doing just that. 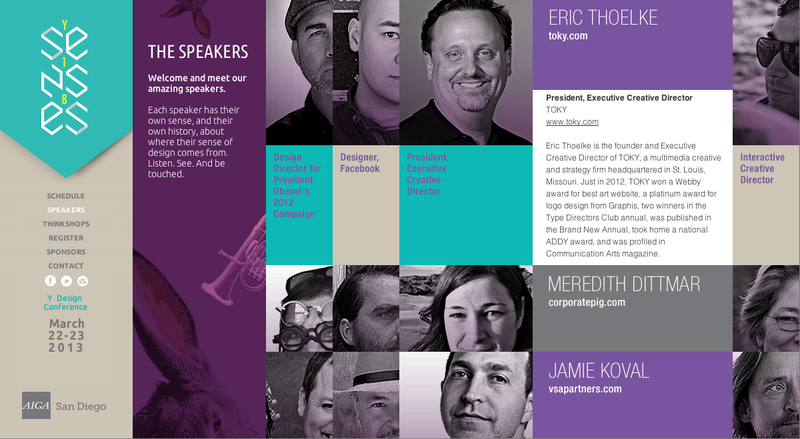 President & Executive Creative Director Eric Thoelke (above) recently returned from AIGA San Diego’s Y Design Conference. Among those with whom he shared the stage: Obama 2012 Design Director Josh Higgins; Facebook Communications Design head Brian Singer; internationally prominent landscape designer Margie Ruddick; VSA Partners President Jamie Koval; and artist and puppeteer Wayne White (a few of our staff have recommended Beauty Is Embarrassing, the recent documentary about him). The subject of Eric’s presentation: Creative work for the not-for-profit world. TOKY has long been committed to groups we consider “world changers,” and he enjoyed talking with peers and students about the rewards and challenges of this particular sector. It’s one we’ll always care about. Early this month, Interactive Creative Director Jay David (above left, center) will begin judging the Interactive entries for the AIGA Cleveland/Northeast Ohio Chapter’s Biennial Design Show. Jay’s fellow judges include top professionals in their fields such as Ann Willoughby of Willoughby Design; Jake Lefebure of Design Army; and Tim Belonax of the Facebook design team. The final selections will be on display and winners announced at a reception at Cleveland State University’s new art gallery, where top honors will be awarded. Also in April, Senior Strategist Natalie Zurfluh (above right) will head south, where she’s been asked to speak to second-year students at the University of North Texas – Denton. Natalie’s presentation, which is focused on the discipline of branding, will be part of the College of Visual Arts and Design‘s Spring Core Curriculum. Lastly, and closer to home, this post’s writer will soon be serving as a judge for the Fraternity Communications Association’s national conference competition, which takes place in St. Louis this May. I’ll be reviewing magazines and websites for fifty or so national organizations, awarding the best submissions in the writing and microsite categories. Thanks to all those who have tapped us for these roles. We’ll enjoy taking part.